Discussion in 'Rivatuner Statistics Server (RTSS) Forum' started by DoloresGrace, Jan 24, 2019. The value does not affect input lag. It affects tearing. Technically, the part of the frame after the tear line is the new one, and thus has less input lag, but if you place the tear line at the middle of the screen in order to get the least amount of lag, then you might as well just run without scanline sync. Scanline sync is for getting rid of tearing. Actually, there's a subtle technicality. - But lag gradient vertically shifts up/down (with a wraparound effect around bottom through top) when you shift the tearline up/down. 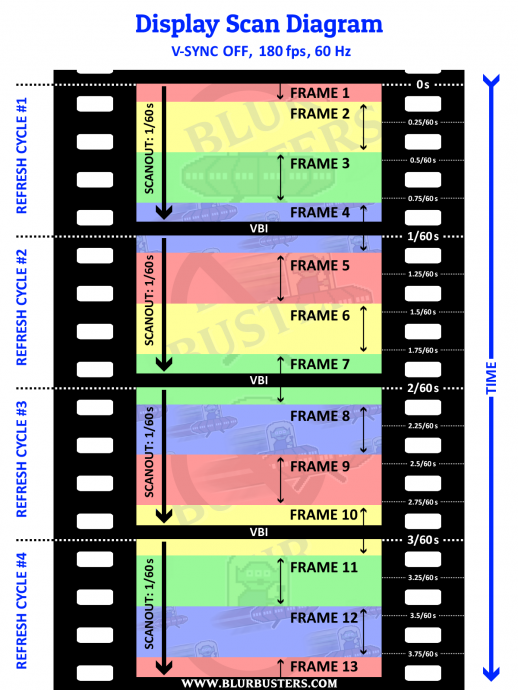 A screen (and also each frame slice) is a latency gradient. This is because of finite-speed screen refresh (high speed videos). Not all pixels on a screen refresh at the same time -- it takes times for pixels to be transmitted over the video cable (the raster scan-out behaviour). If a screen is running at 160KHz horizontal scan rate (view the scanrate in Custom Resolution Utility), then the latency of the pixel row 50 pixel rows below the tearline, is 50/160000sec (about 313 microseconds) laggier than the pixel row immediately underneath the tearline. THEREFORE, moving the tearline affects the input lag of the rest of the screen. Shifting the tearline up/down will shift upwards/downwards the latency gradient effect. The average input lag remains the same, but the latency gradient shift upwards/downwards. To understand the latency gradient of a screen, see high speed video of refresh cycles filmed on the brand-new TestUFO Scanout test. No, it's not wrong. Read again.